In the Marsh family, painting is a family affair. 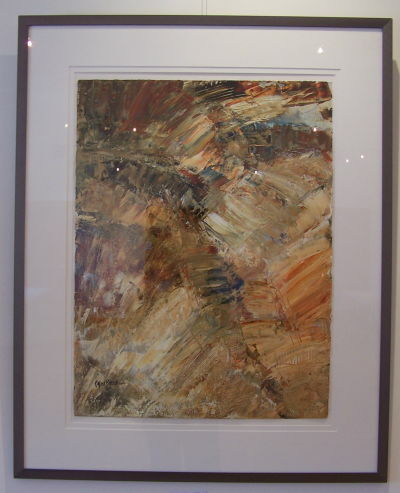 Anne Marsh Evans has long been known for her watercolours and other works which feature local landscapes and architecture. Anne’s daughter, Cynthia Marsh, owns the Marsh Street Gallery and Studio in Clarksburg, and also teaches locally. And recently Cynthia’s sister, Dale, has embarked on her own paintings. Until September 28, you have an opportunity to see the works of all three “Marsh Girls” in one place, at Meaford Hall. The free show runs until Sunday, September 28. A new exhibition at Meaford Hall showcases a story of love and shared passion that found fulfillment in Meaford. 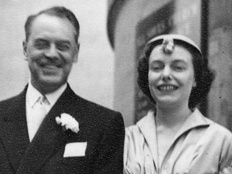 Chuck Finley and Margot Bodwell met in Toronto in the late 1930s, where they both worked in the Advertising Department at Eaton’s. The romance blossomed, though they waited till 1954 to marry, with war service and busy careers occupying much of the intervening years. When they both retired, in 1967, Chuck brought Margot home to his native Meaford, and in their retirement years, they found time to devote to their shared passion for painting. Their works capture many sides of Meaford. 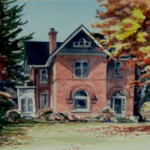 Chuck’s work in oils depicted local landscapes, and Margot focused on watercolours of old barns, houses and municipal buildings. 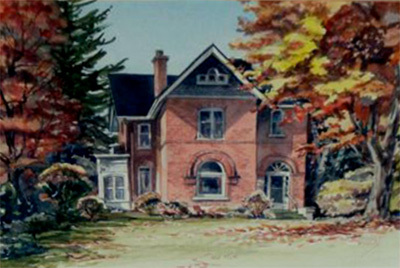 Neighbours and friends admired their work, and Chuck’s and Margot’s paintings hung on the walls of many a Meaford home. Last year, a group of volunteers decided to mount a retrospective of their work, and they put out a call for paintings owned by people in the community. Committee Chair, Jack Morgan, notes that the careers of the two artists spanned much of the 20th century and that this retrospective exhibit would attempt to document some small part of that history as reflected in the lives of the artists. The Charles and Margot Finley Retrospective Exhibition opens on Wednesday, with a reception in the Meaford Hall Galleries on Thursday. Admission is free. The Exhibition runs till July 30. Meaford has lots of opportunities to enjoy the fine arts. But if you’re an artist yourself, you’ve really found a great place to retire to. Do you paint? Photograph? Draw? 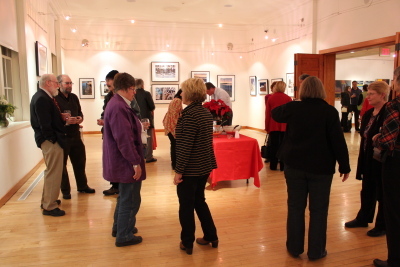 On May 21, Meaford Hall’s Third Annual Juried Show will welcome photography and fine art/2D entries. 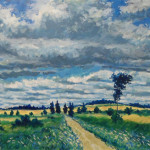 It’s open to artists in Grey, Bruce and Simcoe counties, and those selected by the jury will be exhibited in the in the beautiful, light-filled galleries at the Hall from May 28 through June 23. Top winners will also receive cash prizes. Meaford arts organizations you might want to get to know. Among the casualties of the Second World War was the architecture of Europe. Countless magnificent, ancient structures crumbled under the blasts of bombs and shells. Churches suffered as well; centuries of craftsmanship and painstaking, devotion to craft were reduced to rubble in seconds. But in Meaford, fragments of European ecclesiastical history are preserved in the stained glass windows of Christ Church Anglican. Broken glass from 125 English and European cathedrals and churches have gained new life in the beautiful Gothic windows, and while the stone church itself is more than a century old, its windows contain glass once gazed upon by clergy and churchgoers during the Middle Ages and the Renaissance. The first Anglican service in Meaford was conducted in Stephenson’s Inn in 1856, and six years later, the parish built a frame building on the south side of the Bighead River. In 1876, a more substantial stone church welcomed the congregation, and within 14 years, the stone building had expanded to include a bell tower and a larger building which has now become the parish hall. But when war broke out in Europe, it wasn’t long before Reverend Appleyard heard the call. He joined the Grey and Simcoe Foresters in 1941as Chaplain, and on Sunday, March 22, 1942 preached his farewell sermon before leaving to join the Canadian Chaplain Service. The destruction in England struck him as appalling nearly as soon as he landed. He quickly began to collect shards of stained glass from the shattered windows of damaged churches, and soon began to envision using them for a memorial window at his parish church. On volunteer fire duty one night in the dome of St. Paul’s Cathedral in London, he met an architect responsible for London’s ancient churches, who referred him to the Cox and Barnard Stained Glass Works in Hove, Sussex. The firm offered to design and re-lead the glass into windows to fit Appleyard’s Meaford church – free of charge in gratitude for the Canadian war effort. After being shipped to Europe, Appleyard continued his collection, retrieving glass from churches in France, Belgium and Holland, and a year after the war ended, the church unveiled them as memorials to the parishioners and townspeople who had been killed or wounded during the years of fighting. 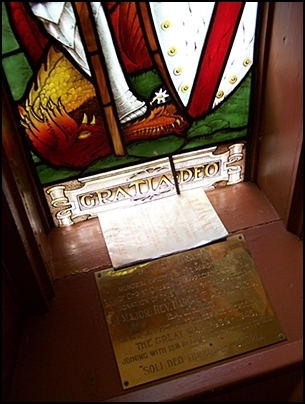 “During my first few moments in England, the appalling destruction of homes and churches alike, along with the courage of the British people, made it desirable to link their sacrifice with ours,” said Appleyard at the service dedicating the memorial windows, his words heard in a broadcast across Canada and Britain. Last weekend, Kerry Riley and David Johnston kicked off their show of painting and photography at Meaford Hall, Recent Works, with an opening reception in the galleries. David and Kerry are long-time Meaford residents, who met at Ryerson University, where Kerry studied applied art and design and David taught interior design. David has always painted. 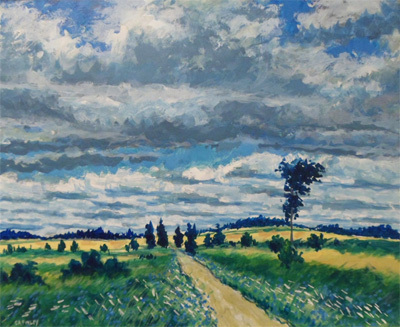 Since studying art and design at the Winchester School of Art and the Central School of Art in his native England, he has exhibited works in Toronto, Hamilton, and at local galleries. Upon retiring from his professorship a couple of years ago, David took to his studio in the couple’s attached garage and indulged his passion for painting more than he’d been able to in recent years, often working into the wee hours. His output has been prodigious, as the new show reveals. David’s work combines stylized objective imagery superimposed on randomly controlled colour fields. Kerry, a business owner and active community volunteer, who was part of the group that initiated the restoration and renovation of Meaford Hall, has continued to work in mixed media and drawing, designing a number of posters for community events and the emblematic scarecrow for Meaford’s Scarecrow Invasion. She has also refined a rare photographic eye, as this show reveals. Borrowing David’s digital SLR camera during the last year or so, she has caught unique glimpses of beauty hidden in landscapes and seemingly random still lifes. The images are printed as she’s captured them in the camera, with no post-processing or digital hocus pocus – just her clear, artistic vision. You can catch the exhibit until January 7. We mentioned the “Fairy Tree” at Ted’s the other day. 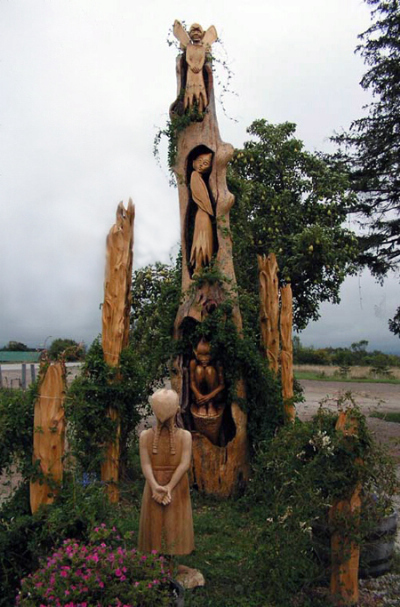 Fran Bouwman, the sculptor who created the work, has a great story about its genesis here. It seems that rather than cut down a dying tree in the parking lot, Ted decided to have Fran turn it into something magical. But when she discovered that the tree was rotten inside, she thought she’d have to abandon the project. But Ted insisted, and Fran persisted. After much thought, an idea struck her. She decided to carve a trio of remarkable fairies to inhabit the heart of the old tree – fairies who captivated the young girl gazing at them. Now, Fran is an amazing sculptor, but she’s also a great singer and musician and has played many a night at various venues around town with different incarnations of her band, featuring Drew McIvor, Jay Stiles, Rich Fletcher and others. One regular gig was the Fisherman’s Wharf, and speaking of the Wharf… we’ve got a bit of news on that next. The canvases have been hung and the winners chosen for the Second Annual Juried Art Show at Meaford Hall Gallery. Drop in to enjoy a wide range of fine art and photography by local and regional artists from now through July 2, or make plans to attend the free reception honouring the winners this Saturday from 2 to 4 p.m.
Artists submitted their work last weekend, and a trio of established artists judged the entrants, choosing three winners and three honourable mentions. Joan Redford Brown won first place for her acrylic, “Rocky Shores”. 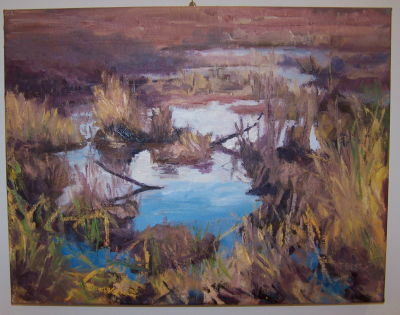 Terry Best took second, for his oil painting, “Swamp Infatuation”. 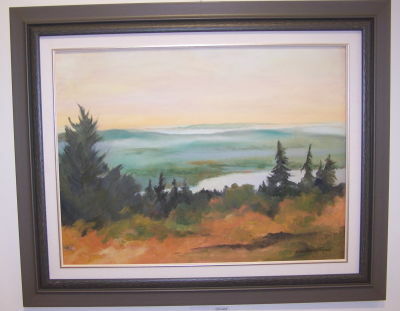 And Anne Evans placed third with her “Mist Saltspring Is”, also in oil. 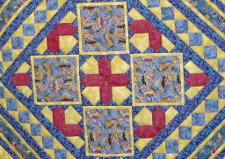 The show is free and open to the public during regular Hall hours and during events. Judges were Merv Richardson, Vlasta Kelemen and Marr Thurman.